The Mustang's debut sits at the fringe of this automotive memory, with the VW Beetle in its heyday and brief glimpses of Sir Alec's Mini. Much clearer are the CVCC Civic and Giugiaro-penned Rabbit (and the Si and GTI) that took the Mini's charms mainstream in the United States. There's the XJ Jeep Cherokee, Chrysler's S platform minivans and the Lexus LS. The first NSX for sure, and maybe the C7 Corvette. Maybe the Tesla Model S, and the hydrogen-burning BMW 760iLh -- Wait. We haven't seen that one yet. Decades beyond there is no precise gauge measuring which landmarks go highest, and precise measurement might be a silly exercise to start. Yet, in the moment, we're pretty sure the 2017 Chevrolet Bolt stands tall. Unleash the dogs if you must, but understand that landmark status for the Bolt is not a political statement. We're looking at the data and reading with the seat of the pants. For starters, the Bolt resolves two persistent knocks on electric cars: cost and range. The data says Bolt will go further on a charge than any plug-in not called Tesla, and further than three of Tesla's eight variants. The Bolt will go at least twice as far as other electric cars, and you can buy it now for $29,995 after a federal tax credit. Yes, you can buy another small car capable of similar work, including Chevy's Sonic, for at least $10,000 less. But Bolt's base price falls $4,000 below the average new-car transaction price in 2016. The seat of the pants says Bolt is a very good small car, regardless of propulsion source, with more space than just about all of them. It's an engineering marvel, though not for any brilliantly revolutionary element. Like many of the landmarks, Bolt's strength lies in its synthesis and refinement of multiple good elements. It's inexpensive to operate and engaging to drive. The Bolt is complicated, and simple. It has 35 separate control modules integrated by a single brain, compared to 20 in a Chevy Cruze compact. It requires high-speed inverters to operate. It runs 140 diagnostic checks when you push the start button, then reaches full operating voltage in 300-500 milliseconds. It offers features like autonomous braking below 50 mph, active lane keeping and automatic high beams, but its success rests in three fundamentals: a high-capacity electric motor, properly geared half-shafts and sufficient "fuel." General Motors' history of electric-car production dates to the long-in-development, short-lived EV1 of the mid-1990s -- the only car branded a ?GM,'' and more costly to build than the market would bear. GM's knowledge base runs deep. Nearly all of the Bolt development team worked on the range-extended Volt or the Spark EV, so Bolt engineers had already learned some things about appropriate aerodynamics, optimum motor or battery design and -- crucially -- optimum thermal management. Ask what they're proudest of, and the answer is consistently "the package:" 238 miles of range with comfortable space for four under $30,000, finished on time. A few note a 0-60 mph time on par with a V6-powered Mustang. The Bolt's motor was developed by GM with rotating AC fields to generate torque -- a peak of 266 pound-feet, with 200 hp. It's manufactured by LG in Korea. The gearbox is permanently lubricated, with a single 7.5:1 reduction gear to the driveshafts, a parking pawl and by-wire control. The fuel? Sixty kilowatt hours of charged particles, flowing at 160 kilowatts and packed into 288 individual cells measuring 3.9 by 13.1 inches. The cells are packaged in a mono-block under the Bolt's interior floor, from the firewall to the rear seat bottom, and weigh 949 pounds (135 more than the body-in-white). The battery pack is also manufactured by LG. It's a stressed component of the chassis, according to Bolt controls manager Pat Foley, and increases torsional rigidity 28 percent compared to the unit body alone. Battery chemistry seems like alchemy to the rest of us, but Bolt engineers say it's crucial to their EV's success. The nickel-rich lithium-ion compound reduces temperature fluctuations and delivers the excellent mix of energy storage (60 kWh) and power flow (160 kW). 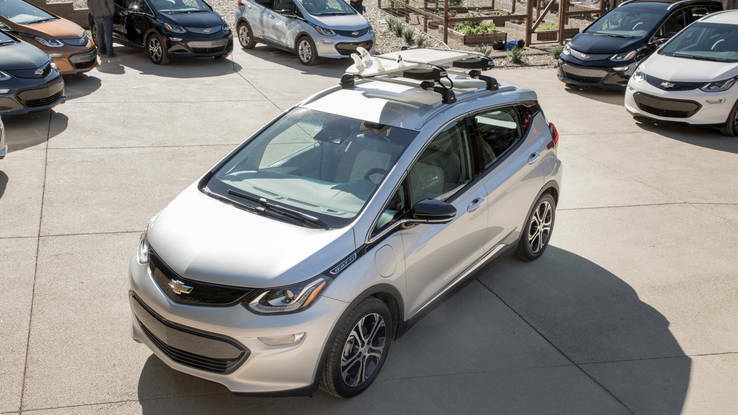 Good thermal management minimizes a reduction of range in extra-cold or extra-hot ambient conditions and helps ensure the charging life to support Bolt's eight-year/100,000-mile battery warranty.